Enjoy a few hours sailing on beautiful Lake Norman with another or several friends or family members. Cruises are available any day or evening during the spring, summer, and fall. Evening sailing around the time of a full moon can also be a unique and memorable time. Our sailing vessel (S/V) First Lady is under the command of U.S. Coast Guard certified Captain Tom Duggins. 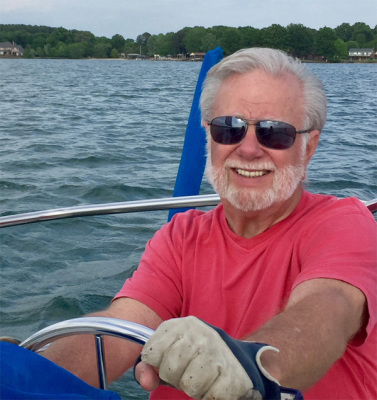 Tom has over 30 years sailing experience on Lake Norman, plus Coastal Carolina and the Caribbean. Typical sailing excursions are three hours, but can be adjusted to suit your schedule. In addition to sailing, we can anchor in a quiet cove for dinner and or swimming. Depending on weather conditions, we sail with a combination of a main sail, head sail or cruising spinnaker or combination thereof. We sail only one party, with a maximum of six guests, for birthdays, anniversaries, family gatherings or just a special day on the lake. 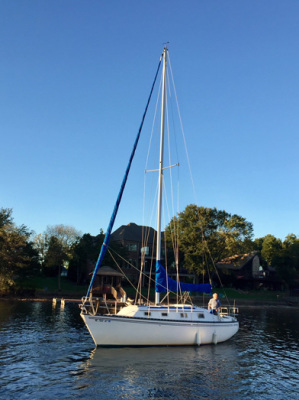 S/V First Lady is a 30 ft. sloop with a cabin including one head (toilet), cold running water, dining table, alcohol stove, ice box and Yeti cooler, VHF radio, life jackets, swim floats and a cabin head room of 6 ft. 2 in. Guests can move around the top sides for seating within the cockpit, the cabin top and the bow. A standard charter is 3 hours, departure to return, truly customized to suit the guest. A 3 hour charter fee is $200.00 for two people, plus $50.00 for each additional person, to a maximum of 6. Sailing times are subject to change without notice due to weather conditions, and can be rescheduled if so desired. Our Coast Guard Captain's license limits us to six passengers, including adults and children. Soft-side padded coolers are preferred. Styrofoam coolers are not permitted. Ice will be provided in on board icebox or cooler. No glass containers are permitted on board. Beverages must be in plastic or aluminum cans. White wine or champagne in bottles is permitted and will be stowed in the galley by the Captain. Red wine is not permitted. Cigarette and Cigar smoking is not permitted on board, nor any other drugs or substances prohibited by law. Shoes with marking soles are not permitted, nor shoes with any type of heel. Only toilet paper and body waste is permitted in the toilet. No other paper or trash of any kind. No one leaves the boat until it is anchored and the engine is off. No one goes in water without something to float on or wearing a life jacket (PFD). As space is limited on this 30 ft. sail boat, don't bring a bunch of stuff you don't need. Sailing attire is very casual. 1. What should we bring? Bringing sunscreen, towels, swimsuits, a change of clothes, and a poncho if rain is likely. 2. What food and beverages can I bring? Snack foods and hors d'oeuvres are recommended, instead of meals, beverages must be in plastic or aluminum cans. Glass containers or drinking glasses are not permitted, like wine or champagne will be stowed in the galley by the Captain. Red wine is not permitted. 3. Why only six people permitted? Our U.S. Coastguard Captain's license prohibits more than six paying passengers, including children. Although this 30 foot sail boat does not accommodate more than six. 4. Must life jackets be worn? Children under 12 must wear lifejackets when outside the boat cabin. Confirm with the Captain what size jackets are available for adults and children. 5. Is there a toilet onboard? A manual pump toilet (head) is onboard. 7. What if there is no wind? Winds can be light and variable in the summer and more consistent in the spring and fall. Anchoring in the cove for dining and or swimming can be an enjoyable part of a day sail. 8.Does the boat lean over? Typically common with good winds, and a full sail, the boat will lean (heel) over. If desired, sail area can be reduced to minimize heel. 9. Can I help sail the boat? Under the direction of the Captain, you can participate to the extent you feel comfortable. 10. What happens if rain is likely? The Captain will make the decision to postpone or cancel the trip; sailing in a summer rain shower is acceptable to some and can be done if so desired.